There are several kinds of bees and bee look-a-likes in the garden. Yellow Jackets give honeybees a bad name. They're yellow with black striping, like a honeybee, but they're smooth, not fuzzy. Yellow Jackets sting. Honeybees are usually pretty docile creatures. They go about their business of collecting nectar and pollen and pay little attention to us working in the garden. Like gardeners, they're especially happy on warm, sunny days when there are lots of flowers blooming. Workers, which are all females, have specialized jobs. One group collects pollen, one collects nectar and one collects water. When there's a brood to be fed in the hive, then pollen is collected. One set of workers does nothing but remove all foreign bodies from the hive: waste, dead bees, etc. If they can't remove it, they encase it in "propolis", bee glue that they make by adding their own enzymes to sap they collect. Bees have one thing in common with cows. They have more than one stomach. They have a pre-stomach, called a honey stomach, which accounts for 1/3 of their weight when fully loaded. The nectar is passed from one bee to another and then maybe another before being put in a cell in the hive. Each bee adds its own enzymes to the mix. In Years past, a couple of mites, the Tracheal Mite and the Varroa Mite, have nearly devastated the populations of bees. Now there is a new problem that is even more vicious, striking honeybee colonies across the country. Scientists are working overtime to find not only a cure but a cause. It’s called Colony Collapse Disorder, or CCD for short. In Colony Collapse Disorder, worker bees just disappear from a hive. You can help the bee population by planting nectar-producing flowers and trees. Asters, red, yellow and white clover, red bud tree, crab apple, veronica, anise hyssop, pincushion flower (Scabiosa), yellow coreopsis, and lavender all are rich in nectar. Pass the word to always read the label of any pesticide used in the garden. Use one with a low residual effect. Insecticides that do the least harm last only a couple of hours in the garden. Apply in the late afternoon or evening when the bees have quit foraging. They'll start again about 9-10 a.m. In early spring, when they're collecting nectar like crazy, they start much earlier. Carbaryl, or Sevin, once thought to be one of the safest of insecticides is also one of the most toxic to bees. It will keep killing anywhere from 2 hours to 12 days, depending on the weather conditions. Its granules are also the same size as pollen and have been mistakenly gathered by bees. If it's taken back to the hive it can kill the whole colony. What is the safest of all practices? Don't use any insecticides. It is up to all gardeners to be responsible in their use of pesticides. 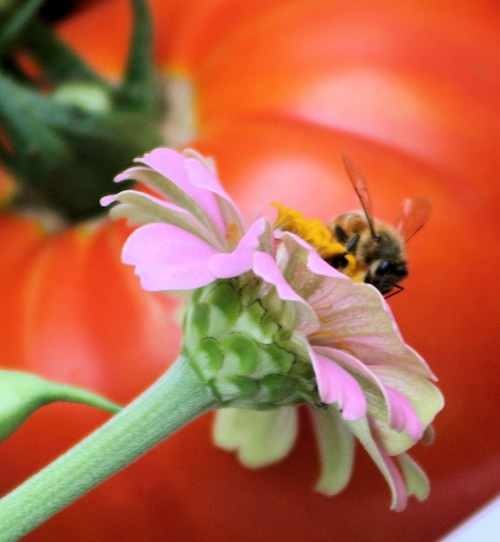 Our food crops depend on these little fuzzy bee-mops.